The Formula E circus is in Malaysia this weekend, preparing for the second race of the season. This is the first time we'll see racing held on a new street circuit in Putrajaya, just south of Kuala Lumpar. 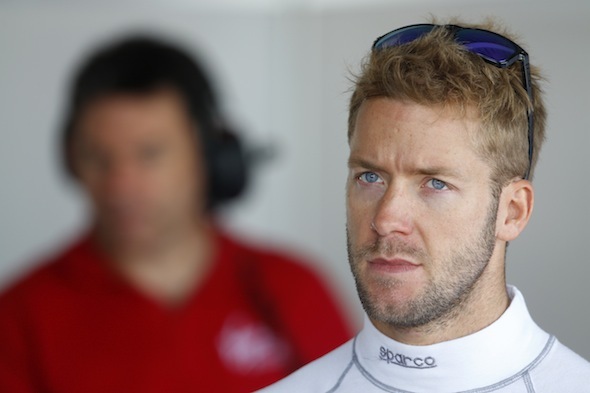 AOL Cars caught up with British driver Sam Bird who stepped onto the podium of the first ever Formula E round in Beijing. He's quietly confident that we haven't seen the best his team, Virgin Racing, has to offer yet. For Bird, Formula E is investing in the future of racing, though he admitted that it is more about mind games than full throttle racing. We spoke to him about the struggles of breaking into his career in racing and the problems around being competitive in an electric car. What does it mean to be racing in the inaugural season of Formula E? To me it means an awful lot. It's something that's pioneering, it's the first of its kind in motor sport and to be associated with that and to be a part of it is quite incredible for me. How did it feel to step on the podium at the first ever race? It was amazing! The podium wasn't just for myself; the podium was for the guys that worked on the cars. We've had a tough pre-season's testing at times, but we've come out of it and we've got a podium at the first race. I genuinely do believe that we're only going to get better and faster from where we left off in Beijing. How did you get into Formula E and how did you end up at Virgin? It's something I was looking at doing at the end of last year. Virgin approached me and I expressed my eagerness to come on board with them - thankfully they chose me as one of their two drivers. It was a long process but we got there in the end. I think Formula E is a great place to be for any driver. You look at the grid that Formula E is able to boast and it's incredible. So, what's the car like? The car, you know what, when I first drove it I was amazed. Mainly by the intricacies of the car, the speed and how it handles – it just handles like a generic single-seater. So, it's very impressive. It's also a thinking man's – or thinking lady's – racing sport. We have to constantly be aware of our battery and where we are with how much power we've got left in the battery. It's a very strategic, mind game, form of motorsport. Was that the biggest challenge when you first tried the car out? When you're striving to achieve the best possible balance with a brand new car it is very difficult because you don't have any kind of starting point. You're unsure of where you need to go with the car. We haven't found the perfect strategy yet but we're still learning. It's exciting to be a part of something so fresh and so new. Does it feel different at all from racing a petrol engine? It does. In a race situation we can't push to 100 per cent. In a normally aspirated car you could push for long periods of the race, whereas in Formula E you have to be far more strategic with your power output and think that every time you're getting on 100 per cent of the power pedal you are effectively using the power life. It's a completely different way of thinking which makes it interesting for us drivers. Who do you see as your biggest competition on the grid? There are many names I could name, obviously the first person you want to beat is your teammate, and that's tough enough because he's very fast. I would say that Andretti, ABT and E.dams look incredibly strong as well – so those three teams are the ones to look out for. How are you feeling about the next round? Optimistic, I don't want to shout and boast like we're going to win or something but we have the potential to have a better result than what we did in Beijing if we apply ourselves correctly. Is there a round you're particularly looking forward to this season? I would say I'm looking forward to both the races in the USA, Monaco and, obviously, my home race in London would be fantastic to win. It's the final race of the year so I need to make sure I'm on the championship hunt going into that one. What's always been your career aspiration or did you just want to race? My career aspiration was always to be a professional racing driver. Obviously everybody has a specific goal, at some point, however that goal being Formula 1 is fairly unobtainable to anybody without a wealthy background – or a huge sponsor. Formula E is a job for me and it's a viable job. We earn from it and it's a fantastic form of motorsport in it gives back, whereas Formula 1 it doesn't. I've moved away from that side of my career now and I'm thoroughly enjoying the other parts of what I'm doing. So you're committed to Formula E and making it the best series it can be? Absolutely, I will do my bit to make sure that Virgin Racing are on top but also to make sure Formula E gets the correct exposure in the right places at the right times to make sure that it's around for an awfully long time.